This is a thinly veiled homage to the Spendor BC1. 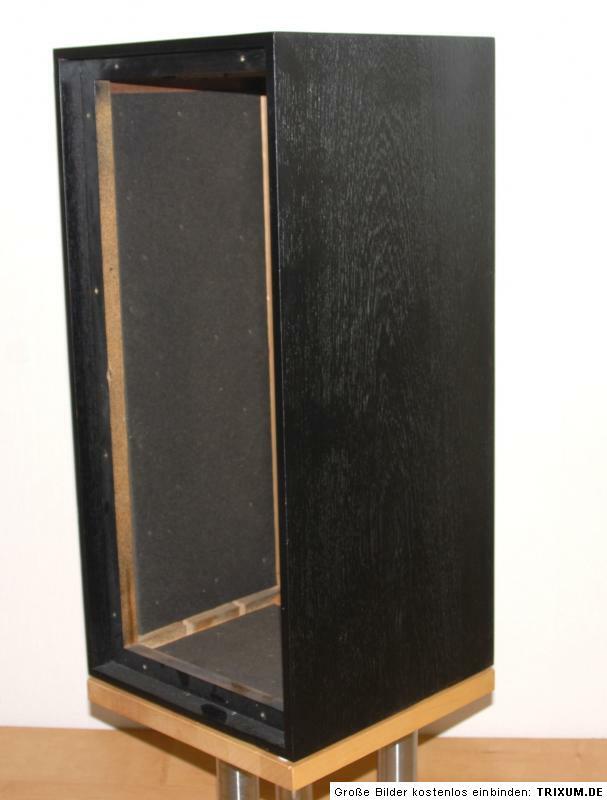 Main features of the BC1 is a thin-walled cabinet with internal damping pads. 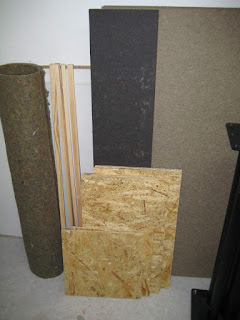 Thin like 10 and 12 mm plywood and then 12mm bitumen loaded soft fibre board as damping pads.The idea behind the thin-walled design is that thin walls and damping brings down resonances from the critical midrange to the less critical bass range. A Bextrene driver with some midrange magic is added. That is has a super tweeter and is bass reflex loaded is secondary features. That the both front is removable and the lip around the front is tertiary featurers. The cabinet is quite close to the original 300x630x300 by just increasing the depth some. 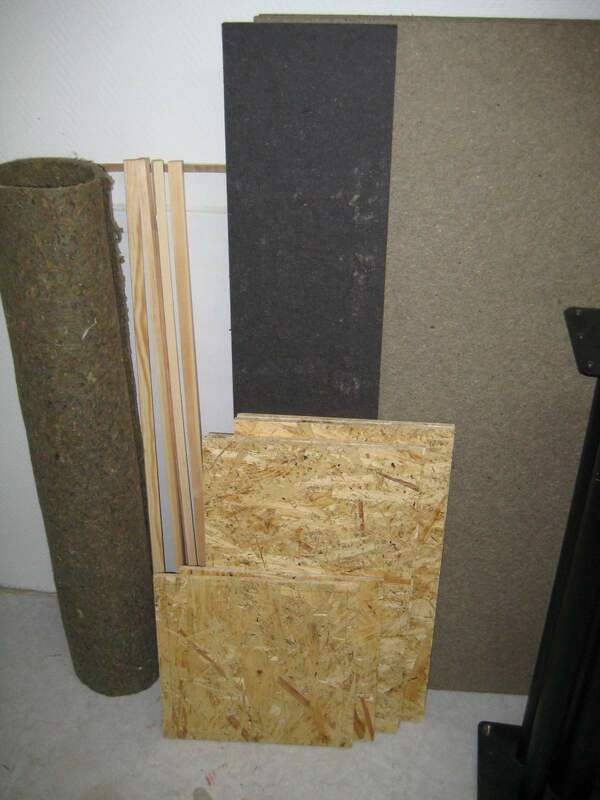 11mm OSB was used instead of 12 and 10 mm Plywood, internal damping is by bitumen impregnated softboard as per the original. All inner surfaces is lined with 10mm felt. This might seem to be odd in a closed box but the thing is that experiments published by Hobby HiFi has shown that gluing felt on top of other damping material is a synergistic icing on the cake! 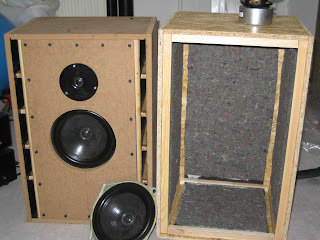 As in the original the front is removable and the bassdriver is rear mounted. In my case to hide the very ugly frame. 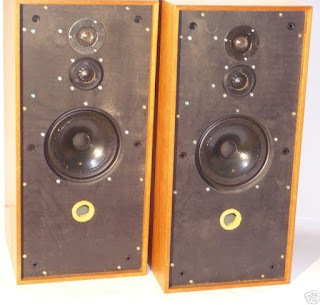 The KEF B200 I have has a ugly metal chassi, showing when front mounted and rear-mounted there is a lip about 3 mm running along the the perimeter making a proper seal tricky and also minimizing the contact area with the cabinet. Bassdriver is a a KEF B200 SP1014 as the Spendor driver it has a to high Q to fit in any reasonable bass reflex box. A closed box is viable but a bit boring. One option us to use Dynaudio Variovents to lower the Q as I have a couple of those left over. Then I read in the excellent magazine Hobby HiFi about using a large serial cap to lower the Q and F3 of the system. Qts*= 1 /( 1/Qms + 1/Qes* +1/Qb) with the box Qb being in the order of 10-20. With a high Q resonance there is too much output at the hump above the resonance frequency and too little below the resonance. The theory is by adding a cap of the right size the cap will interact with the resonance peak and increas the impedance above resonance ( reduce the hump) and decrease impedance just below resonance and thus increase output over a limited range. At even lower frequencies the cap will increase the cut off slope by 6 dB and add protection to the bass driver. In the case of my KEF drivers I end up with a 67 L enclosure and a cap of 800µF (The final value will vary with resistance of any coils in the crossover in series with the driver) for a Q of 1.0 an a Fc of 49 Hz., I cheat a bit and use a smaller box of 350x700x350 mm that has an internal volume of about 58 L and hope that the stuffing will make up for the lacking volume. A way out would be to discard the cap and use variovents instead. 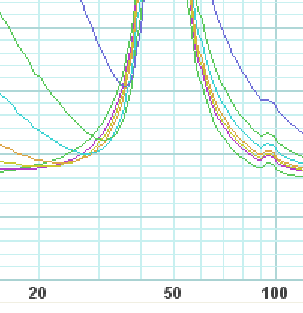 In a lightly stuffed box I got a Fs of 47 Hz and Q of 0.95 not bad at all, this is with no crossover so with that the Q will become higher, in the final version but I wanted to try out the concept. I have a collection of 100µF caps made in West-germany, 22 of them so time to test some combinations. It looks to be in good agreement with theories and now I have to make accoustic measurements as well. For the final results I will have to rerun everything with the crossover in place, but I wanted to get a feel for how useful the technique of capacitor coupled closed box loudspeaker is.